Diabetic retinopathy is a common eye condition in which diabetes results in damage to the blood vessels in the eye, causing them to leak. 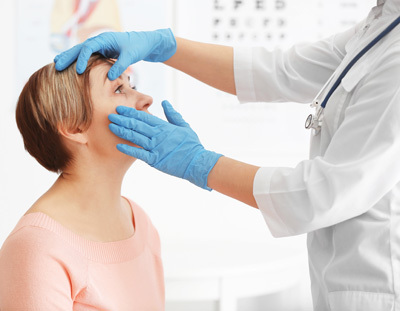 If left untreated, this can result in vision loss or other serious complications. An estimated 8 million diabetic Americans are affected by diabetic retinopathy, making it one of the leading causes of blindness in adults. Individuals who have had diabetes for a while are more at risk of developing this serious eye condition than others. This is because many of these people have higher and less controlled blood sugar levels over time. When diabetes starts to affect the eyes, it can cause the retinal blood vessels to break down, leak, or become blocked. This is dangerous because it affects the oxygen and nutrient delivery to the retina, which can lead to vision problems over time. Even more damage can occur in the retina when abnormal new blood vessels make their way to the surface of the retina, which is another complication with diabetic retinopathy. Mild nonproliferative retinopathy- In this first stage, small areas of swelling within the retina’s blood vessels - called microaneurysms - can occur. Moderate nonproliferative retinopathy - The second stage of diabetic retinopathy is characterized by the blood vessels that support the retina swelling and becoming distorted. In some cases, the blood vessels may also lose their ability to carry blood to the retina. Severe nonproliferative retinopathyWhen the disease starts to progress, it leads to more blood vessels becoming blocked, depriving the retina of blood supply. Proliferative diabetic retinopathy (PDR)This is the most advanced stage of the disease. Individuals suffering from PDR will have growth factors that are secreted by the retina, triggering the proliferation of new blood vessels. These new blood vessels begin to grow inside the surface of the retina and into the fluid that fills the eye. These blood vessels are incredibly fragile, making them far more likely to leak and bleed. Here at First Eye Care, we work with people who have diabetes in order to prevent diabetic retinopathy from developing. Early detection is absolutely key to stopping this destructive disease, so please give us a call today and schedule an eye exam. We have three convenient locations in Hurst, Keller, and Roanoke.